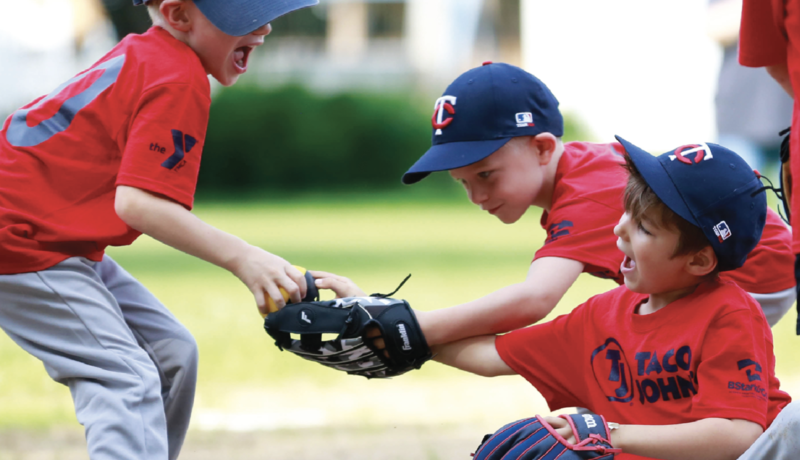 The Youth Sports program at the Mankato Family YMCA gives pre-k and elementary-aged boys and girls the opportunity to learn sports skills in a supervised, low-competitive environment. Fun is first and foremost with youth sports at the Y. As such, it’s important that every boy and girl enrolled plays. Youth sports programs here are devoted to skill development over competition. Winning is not the goal – playing is. Parent support in this area is vital. Encourage your kids to learn skills and have fun in their areas of interest, and they’ll win regardless of the score. Pick up a registration form at the Y or download a registration form online, fill out and return to the YMCA front desk with payment enclosed to complete program registration. View the Program Guide for upcoming Youth Sports session dates, times and fees. Beginner lessons are for the first-time player or young player just developing their racquetball skills or learning the rules of racquetball. At the beginner level racquetball rules are adapted to ensure success for the young player. Advanced Lessons are for youth who have passed Beginner level lessons or who posses the skill necessary to play a game of racquetball according to regular racquetball rules. Serving strategies, court positioning, offensive and defensive strategies will all be emphasized in Advanced Lessons. Handball is an excellent cross-training sport. It enhances agility, speed, quickness, reaction time, coordination and endurance. Handball involves major muscle groups (arms and legs) and helps develops hand-eye coordination. And it’s a great balancing act — developing both sides of the body and brain as participants will be trained to strike the ball with both hands. Is a fairly inexpensive sport that can be enjoyed throughout a lifetime. Introducing kids to the game of basketball in a fun, non-competitive environment. Suited for kindergarten through sixth grade, the goals are for every program participant to be successful and to have a great time. Teams are formed according to grade with the K-2 grade league being coed. The 3rd-4th and 5th-6th grade leagues will have a boys division and a girls division (if participation allows). Teams will practice once a week on weeknights (Monday, Tuesday or Thursday) and games will be held for one hour on Saturdays between 8 a.m. and 3 p.m.
A great way to get ready for the outdoor season. Teams are formed according to grade. The Kindergarten League and the 1st – 2nd Grade League will be coed. The 3rd -4th and 5th – 6th Grade Leagues will each have a boys division and a girls division, pending participation. Outdoor soccer is a fun recreational program with an emphasis on team-work and basic skills in a noncompetitive environment. Teams are formed according to grade. Each class covers the basics of putting, chipping, iron play, use of woods, etiquette, rules, safety and sportsmanship. The first step to a love of baseball is a season or two of T-Ball! The Y’s popular and longstanding T-ball program is designed to introduce the game of baseball in a fun, non-competitive environment. The goal is for every program participant to be successful and to have fun. Teams are formed according to grade. Beginner lessons are for the first-time player or young player just developing their racquetball skills or learning the rules of racquetball. At the beginner level racquetball rules are adapted to ensure success for the young player. Advanced Lessons are for youth who have passed Beginner level lessons or who possess the skill necessary to play a game of racquetball according to regular racquetball rules. Serving strategies, court positioning, offensive and defensive strategies will all be emphasized in Advanced Lessons. Eight weekly sessions covering basic strokes, serving, return serve, backwall and hitting on the fly. All equipment provided. Handball is a sport that can be enjoyed throughout your lifetime. Flag football is designed to introduce the game of football in a fun, non-competitive environment to youth in grades K-4. The goal is for every program participant to be successful and to have FUN! Teams will be formed according to grade. Teams are coed and will practice once a week on weeknights (Monday, Tuesday or Thursday). Experience soccer on a friendly, level playing field that allows for an appreciation of sports and physical activity. Teams will be formed by school and according to grade. The first 15 minutes will be instructional and skill development and the next 45 minutes will be game play.